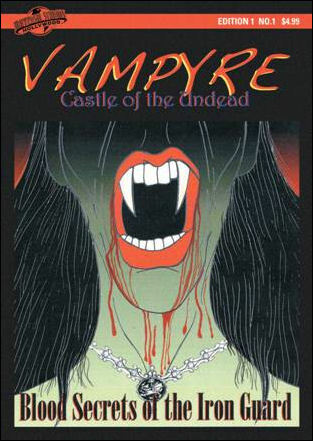 The new graphic novella, Vampyre: Castle of the Undead (Blood Secrets of the Iron Guard), tells a modern tale of the vampires of Wallachia, Romania, the medieval realm of Vlad the Impaler, who inspired the 19th century Dracula legend. With drawings and design by Patrick Ian Moore, the book is based on a maze developed by “Halloween Horror Nights” Creative Director John Murdy with a story by Max Nichts. The novella will be published by Universal Studios Hollywood in conjunction with the 2010 Halloween Horror Nights event, where horror legends come to life. A limited number of collectors edition books will be published and available to guests attending the event on selected nights. Halloween Horror Nights at Universal Studios Hollywood begins Friday, September 24 and will run on consecutive weekends and selected weekday nights through Halloween, Sunday, October 31. Event dates are: September 24, 25 and October 1, 2, 8, 9, 15, 16,17, 21, 22, 23, 24, 28, 29, 30, 31. The event will begin nightly at 7 p.m.; closing hours vary by night throughout the event. Tickets are currently available for purchase with special deals on “Killer Deal Nights” offering up to $25 off regular prices. The “Vampyre: Castle of the Undead,” Halloween Horror Nights mazes will include “A Nightmare On Elm Street: Never Sleep Again,” “Friday the 13th: Kill, Jason, Kill!,” Rob Zombie’s “House of 1000 Corpses: In 3D Zombievison” plus “Saw: Game On.” Among the six “Scare Zones” is a new “La Llorona” experience, based upon the timeless Mexican legend. “Chucky’s Revenge,” an all new “Terror Tram” experience, an express visit to the new blockbuster attraction, “King Kong 360 3D” created by Peter Jackson, and an all new “Bill and Ted’s Excellent Halloween Adventure” show will also be featured within the event.